The ATLAS and CMS experiments hosted a virtual visit together with the IceCube Experiment in the South Pole for students from five different European schools on 2 October. The visit allowed the students to interact with researchers in both the LHC experiments and the IceCube experiment. The virtual visit was a second event in the Open Discovery Space project series' 'Bringing Frontier Science to Schools'. 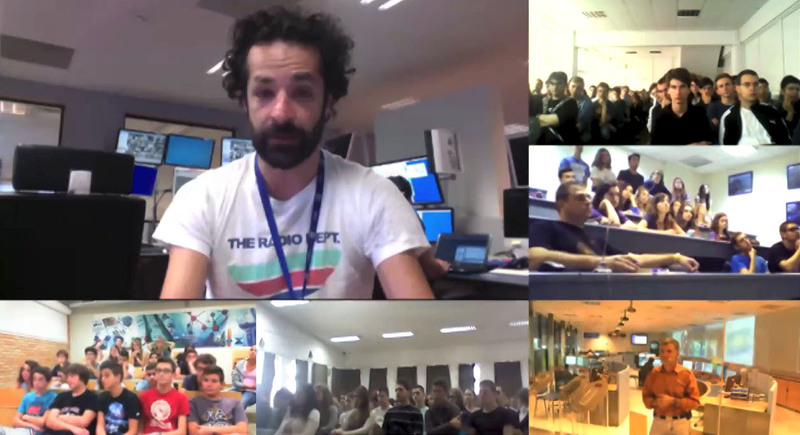 The 380 students, 14 teachers and education specialists who visited virtually were from Sofia Vocational High School of Electronics 'John Atanasoff' in Bulgaria, Ellinogermaniki Agogi in Greece, Leo Baeck High School in Israel, National College Grigore Moisil in Romania and Gimnazija Svetozar Markovic in Serbia. "It was breathtaking and a great opportunity to have our questions answered by the researchers, also live via chat," said Marco Ilic, a student from Serbia. The hosts at CERN – Angelos Alexopoulos, Andromachi Tsirou, Zoltan Zsillasi, Noemi Beni and Steven Goldfarb – connected from three different locations – the ATLAS and CMS Control Rooms and the CMS cavern in the LHC. The hosts from IceCube – Ian Rees and Dag Larsen – connected from the Amundsen Scott South Pole Station in the neutrino observatory lab. Jim Madsen and Megan Madsen also of IceCube connected from the University of Wisconsin-Madison in the US. "I really enjoyed hearing about the everyday life of a researcher at the South Pole. It was so cool to talk with students and scientists from all over the world," said Guy Schwarz, a student from Israel. The visit, which was divided into two parts with presentations from CERN and IceCube, also allowed students and teachers to interact and encourage each other's interest in science. "It's great to work with our colleagues at CERN to show students two different cutting-edge detectors, each with a different approach to exploring the universe," said Jim Madsen, associate director for Education and Outreach at the Wisconsin IceCube Particle Astrophysics Centre. Open Discovery Space brings educational resources directly into school classrooms, and empowers teachers to build their schools' digital libraries, join communities of peers to share best practices, and connect their schools virtually with the world's best research centres, museums and libraries. Watch video of the full visit here.